UDM Downloads > 602PRINT PACK! 602PRINT PACK is an easy-to-use and feature-rich document conversion tool. Easily create Adobe PDF (Portable Document Format), multi-page TIFF, JPEG or other images formats from any application that can print. Be in complete control of file formats. Chose from multiple page sizes, orientations, watermark / stamp insertion and file resolutions (up to 4000 DPI). Create a single PDF from multiple sources using the merge feature. Microsoft Word 2000/XP/2003 toolbar integration provides quick, one-click conversion with hyperlink and bookmark support using the macro. The included Print2PDF print driver supports virtually any application for one-click PDF conversion using the standard print output. Protect and encrypt your documents with PDF security and optimize the document size with image compression. The utility supports the highest levels of security and privacy with 40-bit or 128-bit RC4 encryption and two levels of password protection. Users can specify passwords for opening and modifying documents. Sign documents electronically using a Digital ID (PKCS#12) to verify your identity and provide tamper-resistance. 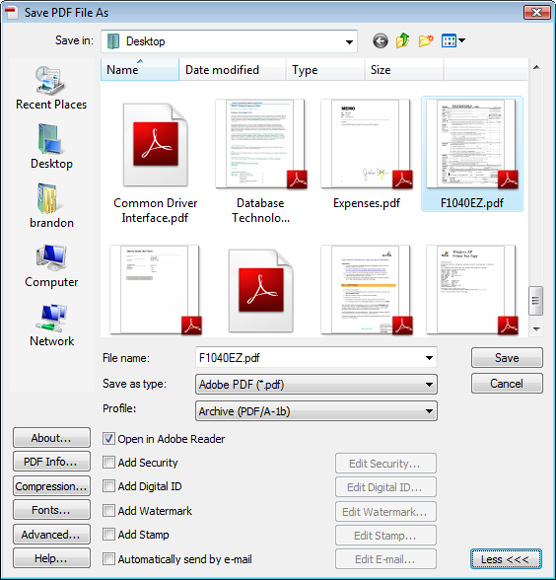 Control the metadata information that is saved to a PDF document. Easily add a title, subject, author and keywords to quickly find the document you need within your document management system. Save time and increase your productivity with the Convert2PDF batch conversion application to quickly convert multiple office documents to the Adobe Reader compatible PDF format. Convert hundreds of documents (.DOC), spreadsheets (.XLS), presentations (.PPT) or even web pages (.HTML) with one click. Convert any document into a common graphic format readable by anyone. Creating full-color or grayscale TIFF (with multi-page support), JPEG, BMP, PCX or PNG files is a snap with the included Print2Picture print driver. View the graphic file in Internet Explorer or any standard graphic file viewer. Use 602PRINT PACK to easily streamline your document archive process.